For my master’s thesis, I conducted a 15 week-long qualitative study where I investigated how businesses can better design services for value co-creation with their customers. To sum up my findings, I developed a tool that enables service designers to connect service elements (stakeholders, interactions, processes) to the optimal value for the customer. I call the tool a Worth Blueprint and it allows businesses to design for value co-creation in a structured and focused manner. The Worth Blueprint belongs to the design framework and mindset called Worth-Centered Design (WCD) – a framework for how to make designs worthwhile for the user to use every day. Value co-creation in services is greatly researched and discussed in various academic disciplines. The concept has gained increasing academic as well as practical interest over the years. This is because by creating value with the customer (hence co-creating the value) instead of creating it for the customer, service providers are able to make more successful services. When service providers and customers co-create the value together, this can lead to increased service performance and quality, better relationships and mutual learning between the two beneficiaries. Value co-creation has thus become synonymous with service success and service providers seek to make it a key part of their business strategies. However, to strategically design services that allow for value co-creation is highly challenging and thus there is a need for solutions for how service providers can overcome the challenges and thereby design successful services that enable value co-creation. This inspired me to conduct a qualitative study of the opportunities and challenges of value co-creation, and furthermore what could be done to solve some of the challenges. From the study I found that Worth-Centered Design offers many solutions to the identified challenges of value co-creation. The framework enables the designer to focus all her efforts on the value the design provides. This means that all design elements always should be connected to the actual design purpose of the solution. 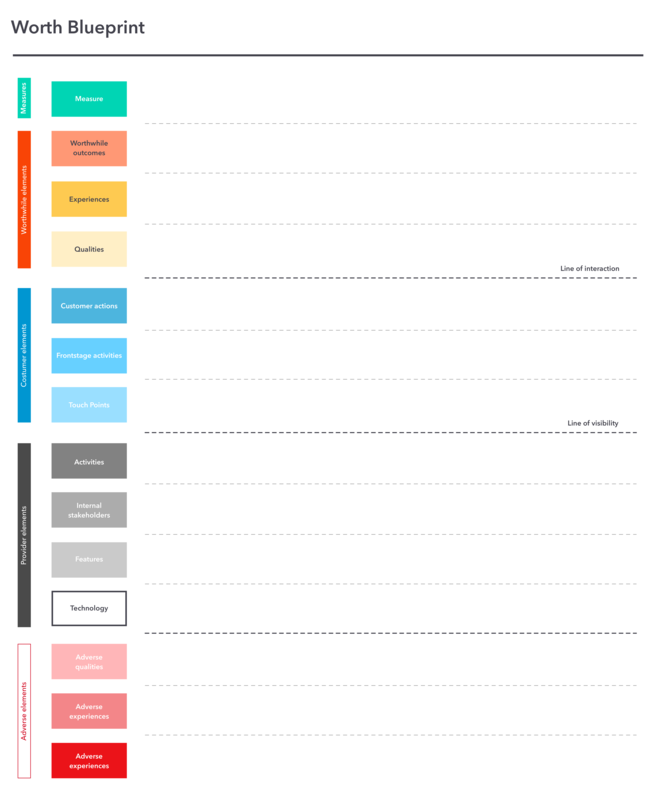 From this insight, I decided to develop a tool for service designers that would allow them to map out the service design elements to the actual value the service provides for the users. The Worth Blueprint allows the designer to map out the worthwhile outcomes of the entire service to the service design elements that make up the service. It makes it possible for the service provider to align all its efforts in the different levels of the organization on the same valuable outcome to the costumer. The figure to the left shows the Worth Blueprint. It has several categories of worthwhile outcomes and service design elements. From top to bottom, these are measures, worthwhile elements, customer elements, provider elements and adverse elements. The idea is to map out the intended worth of the service first, and then to connect all the existing (or future) actions performed to enable this worth.